The Stockroom gallery in Kyneton is holding an end of year show called Span, artists exploring connection, distance and the passage of time. This image is one of two I’m putting in the show, from a new series derived from Google Earth satellite views of various cities. 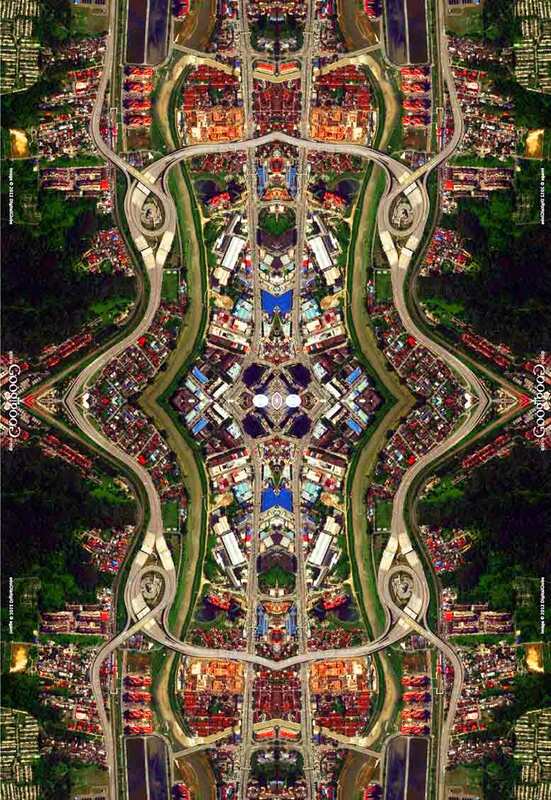 The images show highways endlessly looping in decorative patterns, a tapestry of roads, parks and suburbs. Regional Victoria is not exactly blessed with private art galleries. Most of them show various degenerate forms of craft, what I called the ‘Artesque’, painting or sculpture that looks like art but is really kitsch. The Stockroom is one exception to this rule, its three spaces show work that might be seen in ‘serious’ galleries and project spaces in Melbourne. 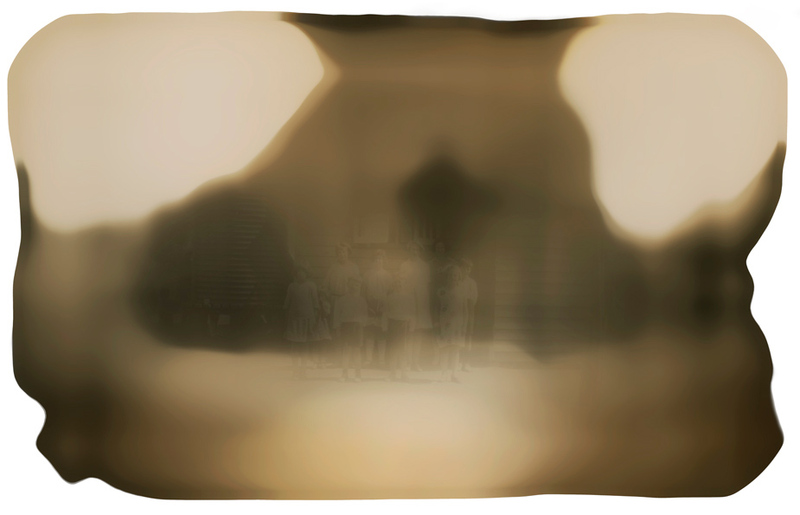 The CCP Kodak Salon opens on November 22 and runs until December 15, the tribal gathering of photographers in Melbourne. This is my piece, a pigment print based on a photograph of my mother and her students in a country primary school in 1931. It may be at Terip Terip, near Euroa (Victoria). It’s from a series exploring my family history through old snapshots. Some were shown last year in 5 Miles from the Sea, and this year at Richmond Town Hall. You need to click on the image to see what it is. News: Since writing this post, the image has won a prize at the Salon – Best Use of a Found Photograph! This is the invitation for my new exhibition Face/Time, a two-person show with my colleague Kirsten Perry. My half of the exhibition features my project Shroud, a series of graphic black & white representations of heads, derived from my passport photos going back decades. It’s a sort of self-portrait project but without reference to individuality. The heads are atomised by repeated photocopying, becoming abstracted forms like traces on a wall. Kirsten’s images are from her Masters degree project, drawing the face using the saccadic eye movements captured by a special camera. She is displaying a sequence of prints showing the face image developing over time. The exhibition is at Tacit Contemporary Art in Abbotsford. The website for the exhibition is face-time.net. The invitation cards were designed by Daniel Neville. According to an article in Discovery News (reported in Peta Pixel), the first digital camera was made in 1975, but the first digital image goes back almost 20 years earlier to 1957. That’s a long time ago for a technology that feels so fresh and urgent today. It was a normal silver print, but scanned and digitised by a very early computer. 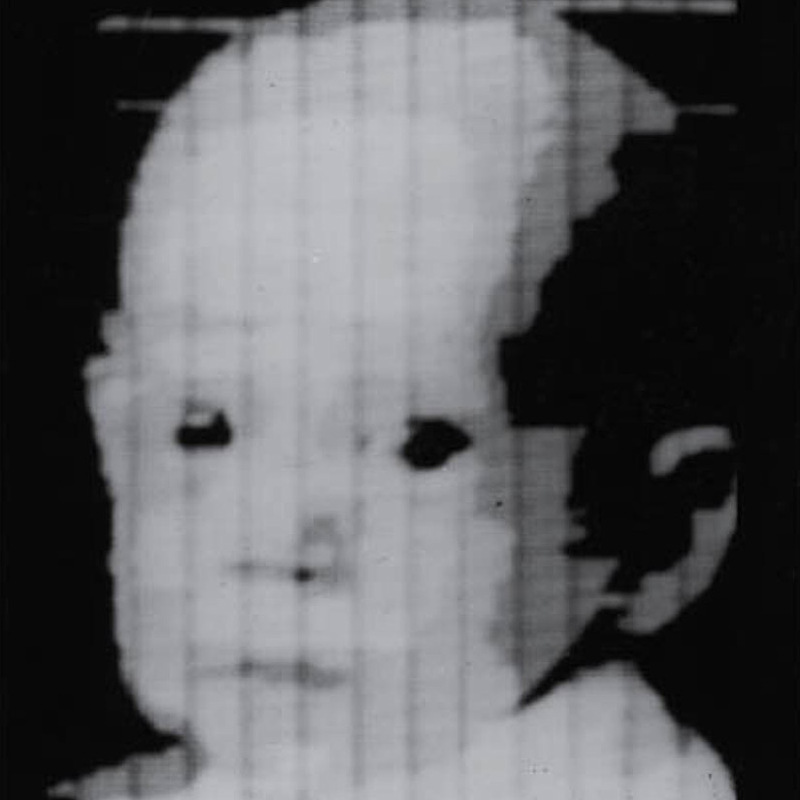 More than 50 years ago, Russell Kirsch took a picture of his infant son and scanned it into a computer. It was the first digital image: a grainy, black-and-white baby picture. Kirsch made that first digital image using an apparatus that transformed his picture into the binary language of computers, a regular grid of zeros and ones. A mere 176 by 176 pixels. 176 x 176 pixels … 30 kilobytes (in grayscale). That would be an inkjet print roughly half an inch square, or 1.5 x 1.5 centimetres. I’m sure there must be a use for it somewhere. Kirsch must be a remarkable scientist. In addition to making the first ever digital image, he and his teams invented the first programmable computer (the SEAC), the first drum scanner and the square-shaped pixel. On this last contribution he’s a little embarrassed and at 82 is hard at work designing algorithms that would scramble the pixel grid, allowing for finer resolution like the random pattern of film grain. And that baby? He’s 55 this year. 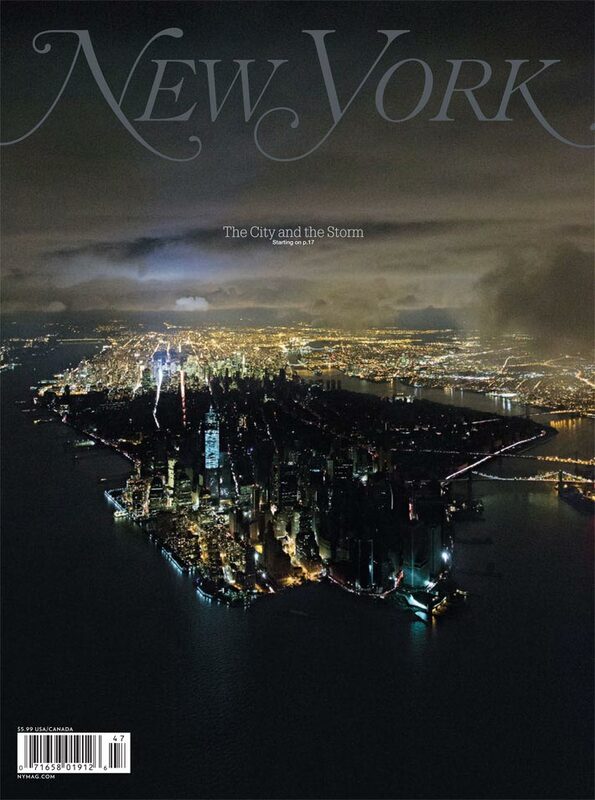 New York Magazine has an impressive image of New York on its latest cover. 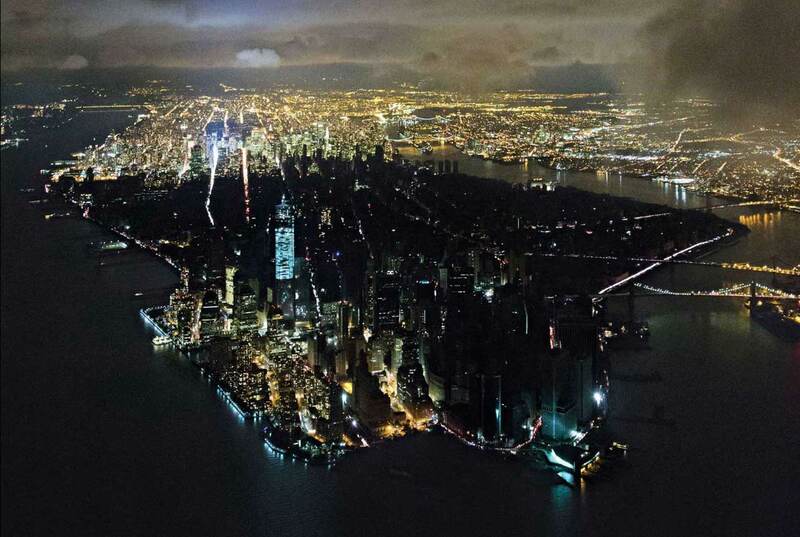 Taken after Hurricane Sandy, it shows Lower Manhattan in blackout, with the rest of the island lit up, a divided city. Dutch architectural photographer Iwan Baan took the shot after the storm had passed, with the air clear enough to see right up the island. Shooting from a helicopter somewhere above the Statue of Liberty, he used a Canon 1DX camera, with the ISO set at 25000. If you look closely, you can see the fine texture of digital noise, but it doesn’t interfere with the image. Baan had the new Canon 24-70mm lens set at full aperture. His exposure was f2.8 at 1/40th of a second. This last fact is amazing to someone brought up on film technology because Baan’s image is a very good example of what the digital revolution in photography means at a practical level. Before digital, he could only have used a high speed film of 3200 ISO, eg Kodak T-Max, although the grain would have been far more intrusive, shadow detail would have been poorer, and it’s a black & white film anyway. If he did, his exposure would have been a 1/5 of a second, clearly impossible to get sharp from a moving platform. There’s a lot of talk in the ether about Instagrammers versus ‘real’ photographers, but Hurricane Sandy has settled the case. The Instagram format has proved ideal for capturing the event at the neighbourhood level and for its instant dissemination over the internet. With smart phones in millions of hands, there are photojournalists on every street corner, and they’re all shooting and sharing wildly. 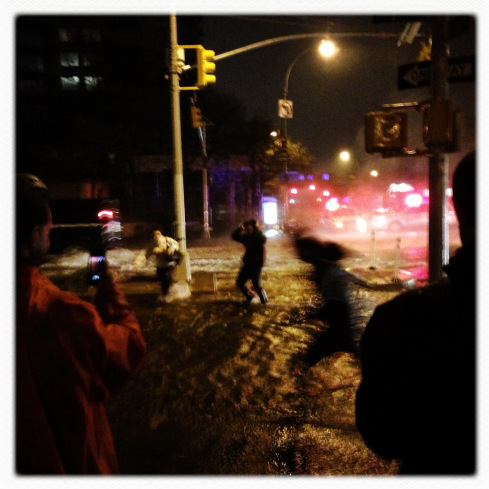 At mobilephotogroup.com there’s a constantly updating feed of Sandy images, many of high pictorial quality. I’ll bet the documenting of this catastrophe will be marked as some sort of milestone in the recent history of photography. Time magazine is harnassing this new form by assigning five photojournalists to cover the event, not with Nikons but with iPhones (the results can be seen here). 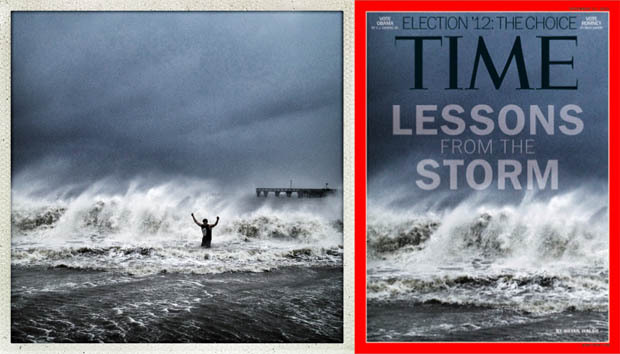 Its new cover features an Instagram photo of a huge wave on a New York beach.